We just picked up a HyperDeck Studio Mini, an excellent rack-mountable SD card recorder, for our live production rig. This video will (hopefully) give you all the details! It's worth checking out our video on the ATEM Television Studio HD too! The HyperDeck Studio mini was created within a similar to design to other Blackmagic products and will take up 1/3 of a 1RU rack unit. This means you can easily stack three of these side-by-side within your rack case. Alternatively, you can pair this with an ATEM Television Studio HD (which is a 2/3 rack unit device). The HyperDeck Studio Mini can record up to 2160p30 which, in our opinion, means that the price tag is a little high when you only want to shoot 1080p50. With that said, it works so nicely with the ATEM Television Studio HD that it's hard not to purchase the two at the same time. It's definitely worth your time to take a look at the recommended list of SD cards to ensure you are using supported cards - this will ensure that you don't encounter issues when recording. You'll notice in our video that we are using the 128GB cards that are not on the list. They've worked great for us and haven't found a reason that they are not on the list. 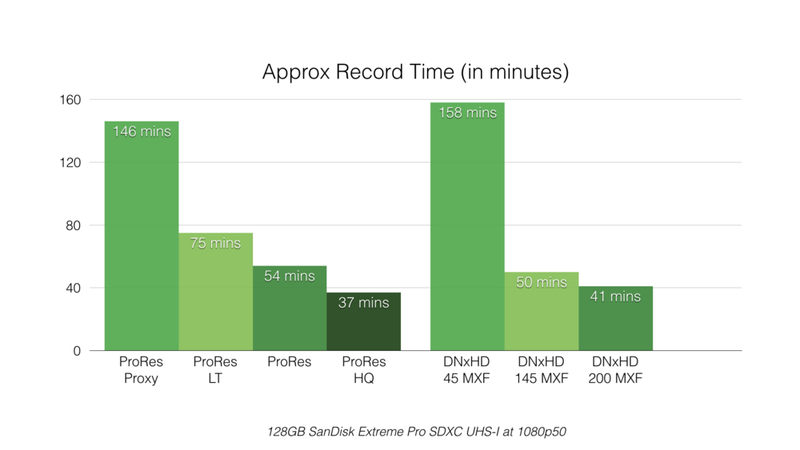 Here is a quick point of reference as to how much you'll be able to record on an SD Card. Note: Recording at 1080p50 with a 128GB card - also note that this card is not officially supported by Blackmagic Design - please stick to a 64GB card for the best results! You can easily move files on and off the HyperDesk Studio Mini via FTP. Just fire up your favorite client (we use FileZilla) and enter the IP address of the device in the "host" box. This will connect directly to the HyperDeck and will allow you to take files on and off it. We love to travel light and pack smart, so the small design of the HyperDeck helps us out a lot. The ATEM Television Studio HD does not have a Program HDMI out. If this is something you need (to run a monitor etc) then the HyperDeck Studio Mini will give you that ability. SD cards are pretty cheap and you can often find deals on Amazon for them. Being able to access the device comes in really handy, especially if you have mounted it in an awkward location within a venue. While they are cheap, they do fill up fast - you'll need to buy a few of them to capture an all-day event. As mentioned above, we tend to only use 1080p50, so the UHD ability of the recorder is lost on us. It would be great to see if an HD-only version was less expensive as this would pair even better with the ATEM we use. Be sure to find the latest price and your local dealer from the Blackmagic Design site. Or, use our Amazon Affiliate link!